Mobility Scooters Q/A – How Often Should I charge My Scooter? At Mobility Nation we are suppliers of mobility scooters and our clients frequently ask us many different questions. One of the popular questions we get asked is, 'How often should I charge my scooter'? The answer is below. Every time you use your scooter, plug it in and put it on charge overnight. In the morning, disconnect the charger. As a minimum, charge the batteries at least once a fortnight to prevent the batteries from “Sulphating” up. The worst thing that people do to mobility scooters is pack them away for the whole of the winter period without charging them. That is why you will always see second hand mobility scooters being sold cheap in the spring. Some scooters (Mainly boot scooters) come with removable batteries so that you can charge the batteries somewhere convenient like a kitchen work surface etc. The mobility scooters we supply include lightweight mobility scooters, car transportable mobility scooters and more. Visit us online for further information. Mobility Scooters Q/A – What does a Class 3 scooter mean? Our mobility scooter customers regularly ask us questions about our products. One of the questions that we are frequently asked is, 'What does a Class 3 scooter mean?'. The answer to this is that it means it is classed as road legal so therefore it will have a UK specified lighting kit with front and rear lights and indicators. Class 3 scooters must also have a speed reduction switch that must be used when riding on pavements. All Class 3 scooters can travel up to 8MPH. 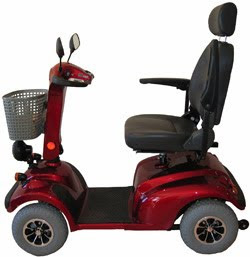 For further information and to view our range of mobility scooters, visit us online. Mobility Scooters Q/A – Why are your Products so Cheap? As a mobility scooter supplier we regularly get asked many different questions by our customers. One of the most popular questions that we get asked is, 'Why are you so cheap?'. The answer to this is simply because we import our mobility scooters directly from the manufacturer. We do not follow the normal supply chain that other companies in the UK do. We are the importer, wholesaler and retailer. Each link in the chain adds on their cut, so therefore we can offer trade prices on our mobility scooters direct to the public. There are many advantages of the lightweight mobility scooters that we supply but one of the biggest advantages of them is that they can be easily transported. Our lightweight mobility scooters are also extremely easy to operate and they are fully adjustable. If you want to find out more details on the scooters we supply then contact us today on 02476 713 913 or visit our website.